Vernice Walkine cut her teeth as a fresh young face in the tourism industry. She spent over thirty years at the Ministry of Tourism, pinnacling her career as Director General of Tourism – the first woman to achieve that position. “Thirty one years is a very long time in one company. But for me, it has been a very short 31 years. I have never been bored. That is the nature of this business. It is dynamic. It is exciting. It is challenging. It is not always easy, but it is always rewarding,” she said when she left the Ministry of Tourism. She achieved another first as she stepped forward into her new role at Nassau Airport Development Company (NAD) in November 2010 as vice-president of marketing and communications – becoming the first Bahamian to join NAD’s executive management team. In March 2013 when Vernice Walkine officially took over as NAD’s president and chief executive, she maintained her leading trend by becoming the first woman to have the top job at NAD. And it is no small job. Not only does she lead a staff of more than two hundred, she is also responsible for overseeing the company’s final stage of a $409.5 million development. No one doubts that she is the best person for the job. But it doesn’t leave her much time for anything else. 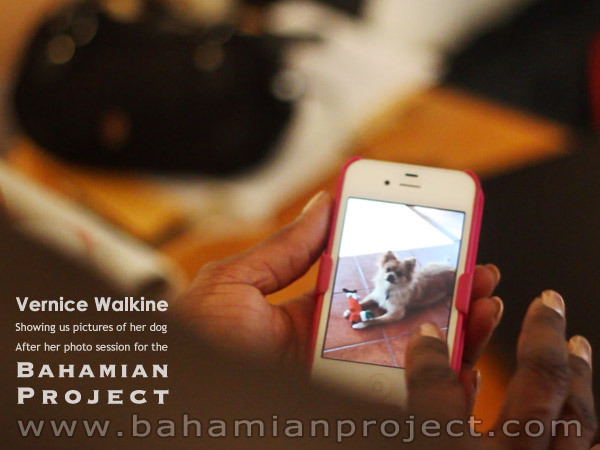 While in our studio being photographed for the Bahamian Project she told us that it can be all-consuming.